Your Sunday Bread: Yahweh or the Devil? “Blessed are ye, when men shall revile you, and persecute you, and shall say all manner of evil against you falsely, for my sake. Rejoice, and be exceeding glad: for great is your reward in heaven: for so persecuted they the prophets which were before you. Ye are the salt of the earth: but if the salt have lost his savor, wherewith shall it be salted? it is thenceforth good for nothing, but to be cast out, and to be trodden under foot of men. Ye are the light of the world. A city that is set on an hill cannot be hid. Neither do men light a candle, and put it under a bushel, but on a candlestick; and it giveth light unto all that are in the house. Let your light so shine before men, that they may see your good works, and glorify your Father which is in heaven.” (Matthew 5:11-15). These days, it will take a lot more to convince me of someone’s character than them saying “I’m a Christian,” because that ain’t saying nothing if all I see is or hear are lies and conniving schemes against the brethren. I mean it, I have had enough of people saying “God says this and that” but still are doing whatever they want, have tossed out the commandments and do everything opposite of what Yahweh says not to do. Don’t tell me Ladies and Gentlemen that someone sings in the choir, preaches and teaches, a deacon, and yet can’t keep his hands and eyes off those who aren’t theirs. Please don’t tell me that because it is a lie from the pits of hell. I am gonna set my face like flint…this is for those stiff necked to whom the truth comes….those who when I bring the word want to snarl, nash their teeth. 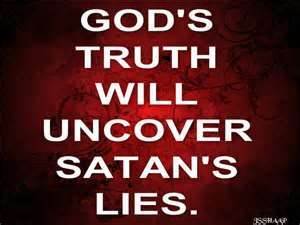 That means that you can talk, but I am called to bring truth….run and hide or take heed. This entry was posted in Environment, Ethical, Family, Marriage, Men issues, Opinion, Personal, Prayer, Relationships, Religion and Spirituality, Spiritual, Women Issues and tagged Barack Obama, Children, China, Christ, Christian, Encouragement, environment, Ezekiel, family, God, Lord, Matthew, Persecution, Relationships, Religion & Spirituality, Religion and Spirituality, Yahweh, Yeshua. Bookmark the permalink.